Welcome to Fiore Motor Classics. Fiore Motor Classics is a licensed NYS dealer specializing in the sale of Classic and Muscle Cars from the 40s, 50s, 60s — and beyond. The company has been family owned and operated since it opened its doors in 2007. Every day since then we’ve worked hard to cultivate a relaxed, friendly atmosphere, geared specifically to those who share our genuine passion for classic cars. From the shop floor to our showroom, our entire team lives and breathes classic cars. Our 12,000 square foot facility is virtually a shrine to those who have visited us over the years. Antique memorabilia graces the walls, creating a truly classic environment filled with many of the most rare and most beautiful cars in the world. We’re open to the public, and many local enthusiasts visit just to look around and be reminded of better time in American automotive history. The facility is fully equipped to service your antique automotive needs, but it also stands ready for so much more — storage, detailing, repairs — it’s all happening at Fiore Motor Classics. We invite you to take some time to join us, even if it’s just to make new friends and enjoy the showroom that took years of dedication to create. Give us a call today at 516-586-6536 — we’d love to hear from you. 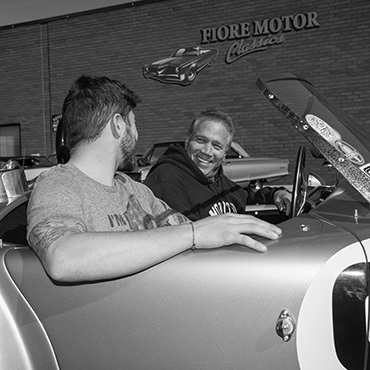 We’re proud of the legacy we’re building, and our shop is the heart of Fiore Motor Classics. Fiore Motors has been family owned since 2007. We eat/sleep/breathe classic cars, creating an atmosphere of excitement and appreciation for those who share our passion. We are fully equipped to service any classic or vintage car need. Performance changes, brake repairs and modern upgrades are a few examples of our mechanics’ capabilities. If we can’t do it, we will recommend one of our highly qualified local affiliates. Our shop is a dedication to all those who have influenced our classic car passion. Classic Cars and antique memorabilia find a great home at Fiore Motor Classics, making it enjoyable for everyone to come in and look around.